OK this bathroom is too good to be true. Im gonna have to find my way into this, who knows them?? TAKE ME!! “This appropriately quirky residence and music studio is as free thinking and boundary pushing as the art and music of its owners, Michelle Martin-Coyne, a photographer and artist, and her husband Wayne, front man of the Flaming Lips. Located in an eclectic neighborhood of Oklahoma City, the addition/renovation of their home is the first phase and central piece of a larger master plan developed for six adjoining properties. These properties, referred to as “the compound” for those familiar with it, is being transformed in phases. Phase one consisted of the partial refinishing of the main house, and the renovation of an existing garage and storage space into a large family room, and a new master suite including the master bath “dragon egg”. The existing low roof structure of the storage space was removed, making room for a new “fractured plain” roof that floats above a ribbon of clerestory windows. This angular roof cantilevers away from the house off a thin exoskeleton of steel, shading the patio below while still allowing indirect daylight to flood the living space. This connection to the outdoors is further emphasized by a wall of sliding glass doors that open to the outdoor patio and expansive yard. 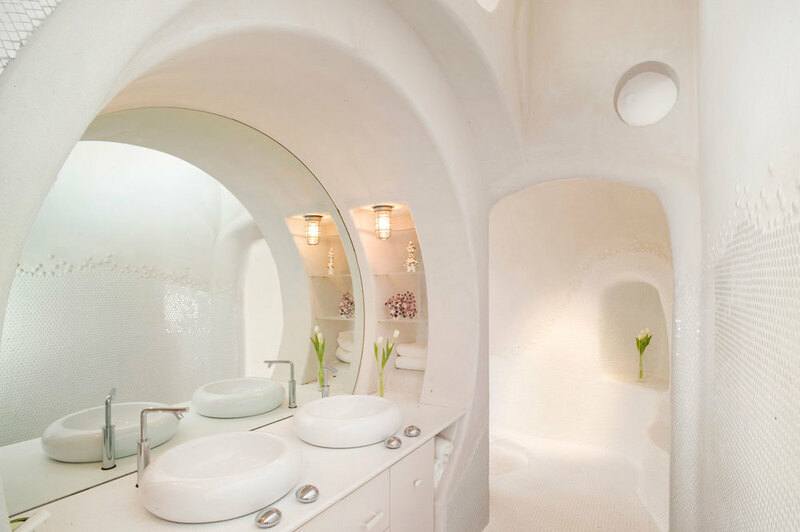 The master suite was converted from a former attached apartment and includes the bedroom, water closet, powder room, large dressing room, and a hall to the “dragon egg” a concrete walled, egg shaped pod that contains the shower and Japanese-inspired soaking tub.